Fluidata – in progress from suzon fuks on Vimeo. On 13 June, Igneous in Brisbane and Bonemap in Cairns will open Igneous’ FLUIDATA with a live telematically linked performance on the big screen at QUT’s The Block in Brisbane. At 7pm you can see the performance at QUT or witness it via live stream. For the performance time in your timezone, look here. 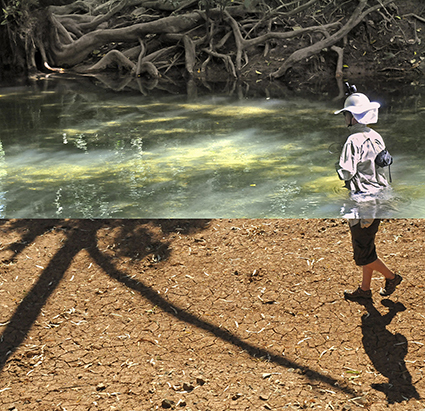 The subject of FLUIDATA is a critical one: water health and sustainability with a focus on the creek systems of Queensland. How thirsty will Australians have to be and how damaged the land before we recognize that we have serious water problems—in the short term with another El Nino on the horizon, in the long-term with radically changing rain patterns, the lowering of water tables and the poisoning of water by coal seam gas extraction? Very thirsty and the land very damaged, if the Australian Government has its way. In the 2014-15 Budget it announced the shutting down of the National Water Commission. The legislation wasn’t debated, but presumably it’s still on the agenda. Stuart Khan, Associate Professor in Environmental Engineering at UNSW, wrote, “During the past 10 years Australia’s water management has been focused by the National Water Initiative and overseen by the National Water Commission. This helped many of our towns and cities through the devastating millennium drought and beyond. The 10-year assessment of the National Water Initiative released by the commission confirms the importance of the initiative for water reform” (“Axing water overseer could leave regional Australia high and dry”, The Conversation, 31 Oct, 2014). Many Australians, especially those living in cities, seem unaware of the impending crisis. The mass media pay inconsistent attention, but Australian artists and a large network of their overseas collaborators do. Suzon Fuks and James Cunningham describe their new work about water, FLUIDATA, as “an explorable, immersive installation with durational performances.” The pair comprise Igneous, a Brisbane-based intermedia and performance company and the force behind Waterwheel, the ambitious online site dedicated to dialogue and creative expression around the global challenge to water sustainability and health. Fuks and Cunningham ventured out of Brisbane to discover for themselves the state of Queensland creeks, following them and talking to locals. Why the focus on Queensland creeks and where did it take you? We wanted to experience our home state, having travelled a lot overseas and worked with projects internationally through Waterwheel. We wanted to work on a project that combined our interest in mobility, accessible technologies and waterways, and with conscious physical attentiveness to environments. The trip took us 7,500km, we crossed 663 waterways, walking up dozens of them in places as diverse as tropical Cairns, outback Cloncurry, remote Longreach, lush Carnarvon Gorge, and to mining towns like Blackwater and Miles. What kind of installation have you designed for FLUIDATA? It’s been designed around the metaphors of “the straight line” and “the meander.” There are three pools of water that reflect projections on black scrims and walls. The creek names, GPS co-ordinates and statistics—collected from all over Queensland—are set to cascade into a narrow channel of water. Visitors who stay a while may detect the incremental movement of precise lines—creek-walk GPS tracks meandering across the walls and corners of the room. The air itself is moved by the rumbling of road-trains meeting the babbling of creeks. In the Waterwheel engine room they can navigate the media centre and in the meditation room lie down and let go—washed over by sounds and images of freshwater textures. Through QUT Creative Industries Precinct's Digital Associates Program we have access to The Block, which is a very large exhibition space equipped for large-scale multimedia presentations. The program supports selected artists to realise ambitious projects. FLUIDATA is Igneous' biggest project to date. How will audiences connect with the environment you’ll create? There are multiple ways in which the installation invites visitors to connect to the immediate environment of the space, to their internal environment, to ideas they have about natural environments and to their memories of them. The media showing in one set of large projections responds to the amount of time people spend with them, and the number of people. The media on a meandering line of monitors responds to the direction people move in front of them. Recorded spoken cues (on mp3 players and coming from mini-speakers) guide visitors to bring awareness to their own bodies walking in the space. They can contribute memories to a Twitter feed and freely browse media archives on computers in the engine room. What’s unique about the installation? The agency people will have in choosing which elements to engage with and for how long, as well in the way that some elements of the installation will respond in different ways for one person than for a group. Each visitor will have a unique experience as well affecting others’ experiences of the installation. How will the live performances relate to the installation? At designated times during the run of the installation, we will enact live, durational, networked performances. In keeping with the installation themes of time and presence, we’ll utilise simple, repeating gestures or movements such as walking in water, or placing a drop of water into the palms of visitors’ hands using an eye-dropper. These actions will be webcast online via Waterwheel’s Tap and projected onto the mega outdoor-screen in the adjacent Parer Place. On the opening night Igneous will team up via video with Cairns-based performance and media group Bonemap at the Centre of Contemporary Arts in Cairns for a collaboratively devised networked performance. The biggest set of Tap events to date was the week-long 2014 Waterwheel World Water Day Symposium. Scientists, artists, ecologists, communities and young people responded to the theme “Water Views: Caring and Daring.” Four hundred and fifty participants from 34 countries across 5 continents interacted with a live audience on the Tap and in 18 physical venues or ‘nodes.’ The Symposium focused on integrated youth and inter-generational dialogue with a “Voice of the Future” strand. In 2015, Igneous published an e-book on the Waterwheel World Water Day Symposium with 125 articles with three types of entries, based on presentations given as part of the Symposium: “Splash”—project overviews, “Ripple”—detailed project description, and “Wave”—peer-reviewed articles on original research. The e-book is available for free download. Beginning in India in 1993, Igneous grew out of a collaboration between Australian dancer-choreographer James Cunningham and Belgian-born director-choreographer-photographer-multimedia artist Suzon Fuks. Igneous’ interests lie in process, interaction, diversity and challenging values. Early works included video-dance, documentary photography and short stage performances that combined dance with projected media. Body in Question (1999), Igneous’ first evening-length show toured in Australia and Europe. An Asialink residency in South India (1999-2000) provided an introduction to the grounding, rhythmic and fluid traditional martial artform Kalarippayattu, the basic forms of which Cunningham and Fuks adopted into their daily physical practice. In a residency at Brisbane Powerhouse (2002-4), they developed a serial installation performance that unfolded over seven nights throughout the site. Performance works include The Hands Project (2001), Thanatonauts (2004) and Mirage (2007). International residencies and tours enabled the artists to collaborate on co-productions, including Liquid Skin with Figuren Theatre Tubingen for the Theatre der Welt Festival 2005. Their interest in alternative use of spaces, the distribution of media and audience engagement led to them researching networked performance and developing their practice online. FLUIDATA opening 13 June, 6pm; performance at The Block 7pm and via live stream here. For the performance time in your timezone, look here. Igneous, in association with the QUT Creative Industries Precinct Digital Associates Program, FLUIDATA, The Block, QUT, Kelvin Grove, Brisbane, 13-20 June.